Also known as sweet oranges (Citrus sinensis), Florida orange trees are compact and symmetrical and besides bearing fruit, make good ornamental trees. There is a wide range of varieties, and the most well-known is the Valencia, which is a popular juicing orange. The orange blossom, which is small, fragrant and white, is the Florida state flower. 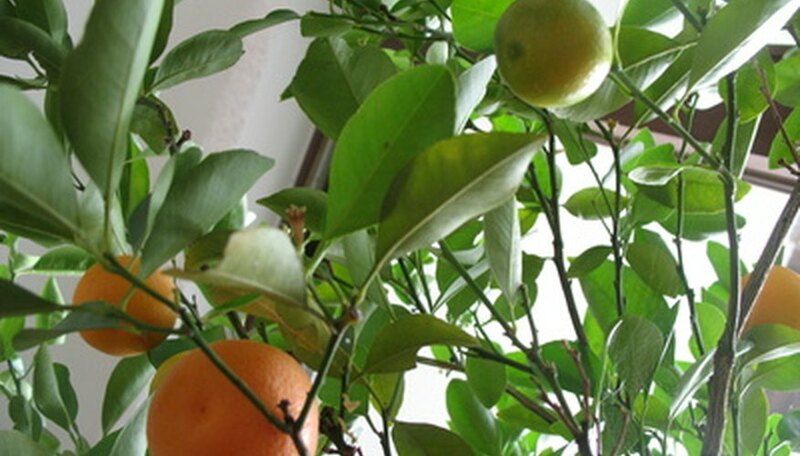 Florida orange trees have glossy, leathery oblong leaves and the flowers give way to fruit, which may be stored on the tree for several months. Trees grow to about 25 feet, need full sun and moderate watering. Sweet oranges need high heat to form sugars, making Florida a natural spot for these trees. These trees are hardy in USDA Plant Hardiness Map Zones 9 to 11. Recognized as the best juicing orange, the Valencia variety bears fruit as early as March in the warmest areas and into July in cooler areas, according to Floridata.com. The fruit is about the size of a baseball, is nearly seedless and has a thin skin. Grown primarily in Florida and parts of inland California, the Valencia is available in several cultivars, including Delta and Midknight, which ripen earlier in the season, and Rhode Red, which has deeper colored flesh. The original navel orange, Washington oranges have thick skins, are easy to peel and have moderately juicy flesh. These eating oranges may be grown in Florida and Texas and ripen early. Washington oranges are usually seedless. Another popular navel is Cara Cara, which has a rosier flesh and may also be grown in California. This cultivar ripens later than Valencias and most navel oranges and is the top mid-season orange in Florida, according to the 1997 Sunset National Garden Book. Pineapple oranges have light-colored flesh and fairly thin skin, but are seedy. Good juicing oranges, pineapple oranges may fall from the tree after ripening.